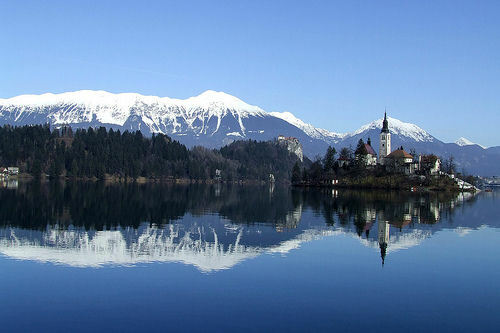 Slovenia is small country in the south of Europe and it is often confused with Slovakia or also some other countries. It has only 2 million people with its own language called Slovenian. Despite that the country is very small, it is very diverse because you can find a lot of different things here. You can visit Julian Alps, find interesting lakes, and view beautiful waterfalls. There are also spas, many caves, karst phenomenons, the Adriatic Sea and much more. Because distances are small you can visit many places just in one day. Lake Bled is one of the most visited tourist places in Slovenia. There you can see the only real island in Slovenia because on the coast in Slovenia there is no one. Above the lake is a castle, so the entire scenery looks like it’s from fairy tale. Not far away from Bled is the interesting Vintgar Gorge. Another very interesting lake in Slovenia is Lake Bohinj, which is situated on the border of the Triglav National Park. It is the only national park in Slovenia. It is bigger than Lake Bled and has less tourists, so it is more suitable for nature lovers with a lot of possibilities for hiking and different sports. The Capital of Slovenia is Ljubljana, which is located almost in the centre of Slovenia. So if you stay there, you will have good starting point for every trip in Slovenia. Ljubljana has wonderful old town centre with a castle above that is worth to see. There are also a lot of museums, parks, shopping centres, etc. Must see sight is Slovenia is also Postojna Cave or Skocjan Caves. Both caves are wonderful so you will not regret to visit any of them. Postojna Cave is interesting also because of train ride at the start of visit. Not so far from Postojna is Predjama Castle that is located in the wall. It is really very interesting with many floors and also some cave behind the castle. During visit of the castle you will discover different hidden passages, torture caves, etc. Piran is old Mediterranean town with great squares and many narrow streets. Above the city is church of St. George with excellent view of the town and neighbourhood. You can also climb on town walls, visit some museum or just sit down in one of the many bars or restaurants. These are just short description of Slovenia. Find many other interesting things beside those in the links above, or visit Kraji’s Lensmaster profile on Squidoo. Intro photo of Bled Lake by flickr user mirci.